Haridwar, May 14 : Social activist Anna Hazare visited Shanti Kunj here, the headquarters of the Gayatri Parivar, and began his Jan Jagran Yatra for Uttarakhand Tuesday. Speaking at the Mrityunjaya auditorium at the Dev Sanskrati University here, Hazare said he felt "charged" after visiting the campus and called for a change in the system, rather than mere change of power from one party to another. 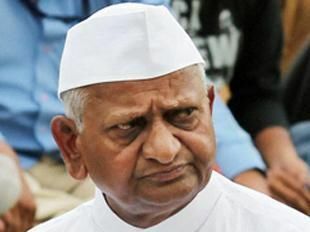 Urging people to replace all elected representatives who did not work for the welfare of the people, Hazare said the time had come for a corruption-free and people-oriented political system.